In case you didn’t know I’m not so good at crafting but when it comes to snacking I’m pretty darn awesome. We were recently given the opportunity to combine the two thanks to our friends at MomTrends and wonderful halos. I struggled a bit with the crafting portion but definitely held my own when it came to snacking. JustaBXgirl of course did great with both! It was so much fun to get together with some of my favorite blogging mamas, our littles and some really good recipes. Don’t be jealous. I am here to share with you not only some yummy recipes (please invite me over when you try them) – told you I like to snack – but with some really fun (and easy) crafting activities just in time for Easter and Spring Breaks. Who says you can’t play with your food? Definitely not halos. I’m telling you these crafts are so easy I could barely mess them up (don’t mind the uneven chick wings I cut for JustaBXgirl). Even though I’m not great at crafting we do a lot of it in our house. I’m always looking for projects to keep JustaBXgirl and her cousins away from screen time. She’s also really good at crafting, coloring and painting. I’m also always looking for candy substitutes for the Easter baskets. This year I will be filling them with halos instead of chocolate eggs. 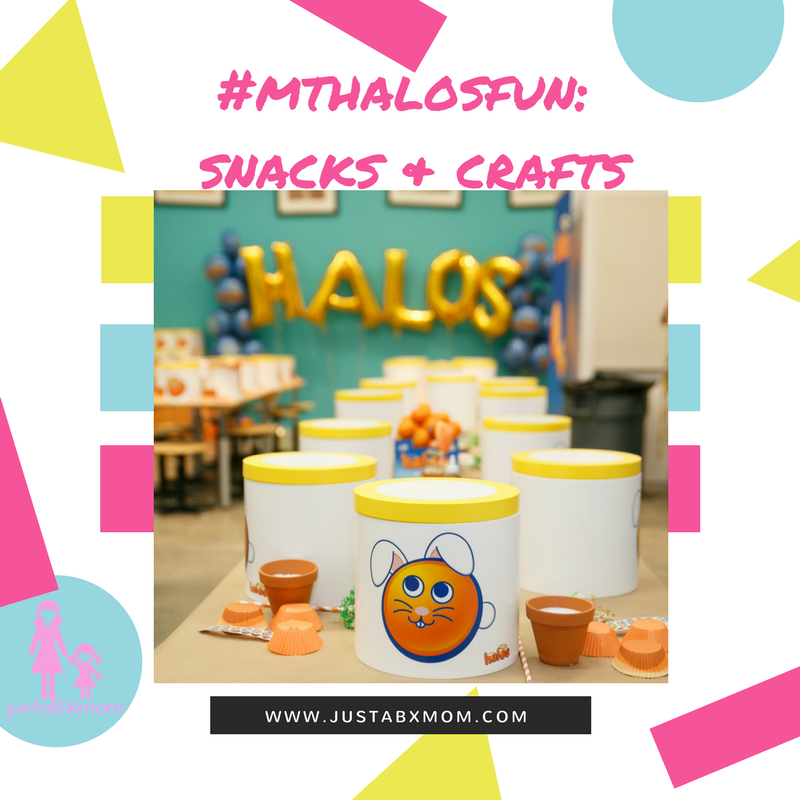 We did three halos crafts and one halo inspired craft during the event. A chick, a flower and a bunny were the halos ones and then inspired by one of her buddies JustaBXgirl created a tree and made a table out of straws so that her chick and bunny could relax under. She was instructing me on what to do. 1. Cut the chick’s wings from yellow paper. you can create a feathered effect by cutting little slits into the paper’s edge. fold them bck at the base nd secure to the sides of the halo with glue dots. 3. Fold yellow paper and cut a little triangle for the beak. Use glue dots to add the beak and googly eyes. 1. Cut the bunny ears from white and pink paper. Fold them back at the base and secure to the top of the halo with glue dots. 2. Cut a pipe cleaner into three pieces and twist to form the whiskers. Add a pink paper triangle for the nose. 3. Use glue dots to add the googly eyes and cute pom-pom bunny tail. And while the littles are crafting try this recipe that look almost too good to eat! Look at that sweet little smile! She’s a crafting master! She really is! Meanwhile I am the complete opposite. She’s always trying to help me get better.